I dropped by the store yesterday and picked up a few trims and elastics to make a few headbands and also make some new shorts (whenever my studs arrive! ), so I can't wait for that. On another completely different note, Maybelline New York has come up with a brand-new mascara brilliantly named "LOL"; NO, it doesn't stand for "laugh out loud", but for "Lots of Lashes". It is mainly targeted for the bottom lashes, which sometimes is an issue for us girls. It combines the famous Great Lash Mascara formula and a spiky-ball shape (resembling the Givenchy one from last year!). It's designed to get at corner and bottom lashes, and to eliminate clumps. And though you may giggle at the plastic fuchsia pine cone that now crowns your mascara wand, I promise the results are seriously gorgeous. 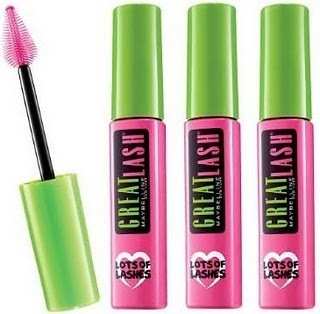 Maybelline LOL Great Lash Mascara, $4.50/tube at Target.